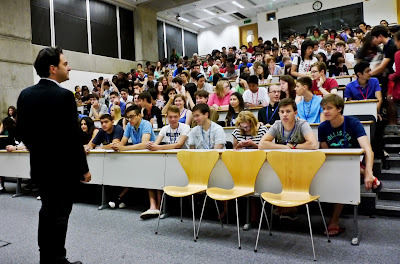 Professor Gianfranco Bertone has been one of LIYSF 2013 speakers. He came last Saturday 27th July and conducted an incredible lecture about ‘The Worldwide Race to Discover Dark Matter’. Gianfranco is an Associated Professor at the University of Amsterdam who has taken part in many projects in the field of Astrophysics. When we look at the sky, we see stars and galaxies and we believe that this is all. However, something outside is altering our equations: galaxies and stars don’t behave in the way there are supposed to. We do have evidence of its existence but we don’t know anything about it: it’s dark matter, something our eyes cannot see. Mass distorts space. So, if we look at a galaxy through the sky and there’s mass between us, the light will be distorted. 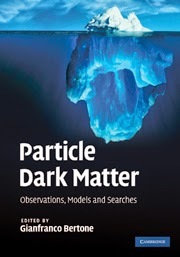 There are a lot of candidates for dark matter (such as neutralino) but the important think is how we detect it. Gianfranco Bertone is working in this field and told us about three types of detection: colliders, direct and indirect detection. All these techniques point out an excess of energy caused by dark matter. Lots of laboratories and research groups have spent years trying to identify dark matter and still we don’t know too much about it. This means that new ideas are needed, and these ideas might be our own ideas. The ideas of a new science generation, our generation.